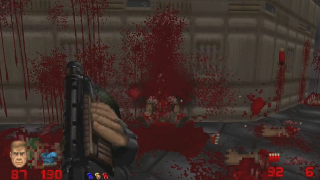 Sure, you could question why Brutal Doom needs destroyable bodies. It has no legitimate purpose—in fact, it's a ridiculous waste of ammo. But then, it's Brutal Doom. Yes, the B in Brutal is capitalised because it's a name, but it's also capitalised in spirit. Sometimes being Brutal means splashing about in '90s sprite-based guts. Is it helpful? No. Is it Brutal? Yes. That is literally the point. Spreadable body bits were removed from Brutal Doom's v19 update. For the long-awaited and still unreleased v20, they'll be back. Here you can see just what that means. Inevitably, whenever I bring up Brutal Doom, someone complains that there are other Doom mods worthy of attention. This is entirely true! Here's a bunch of them.